This article offers the answer of the best video formats for PS4, covering audio and video format extensions, the appropriate resolutions, file size, codecs and audio/video formats supported by PS4. PS4 destroyed Xbox One with a strong worldwide sales as many as 30 million as of Nov 11, owing to the integration of the successful media player that's said to be compatible with a large variety of file formats, including 4K, to some degree. The large variety, however, is by no means everything, e.g. you cannot play videos (MTS) that aren't PS4 video formats supported. Here comes the question, what are PS4 supported video formats? Can PS4 play MKV, MP4 or so? If you are AV enthusiasts and breaking too much of a sweat to have your videos/music playing from your PC, just take a few minutes to get the answer. Free download world's no.1 fast PS4 video converter to transfer any videos (MOV, FLV, MOD, 4K, etc) to PS4 supported video/audio formats (MP4, MKV) with best file size and resolution. 5X faster than competitors and no quality loss. 6. MPEG2 Visual with MP2, AAC LC, AC-3 audio in .ts file format. 1. For a smooth playback of the audio/video files on PS4 via its media player, make sure to save the to a folder so that they can be readable by the system. 2. 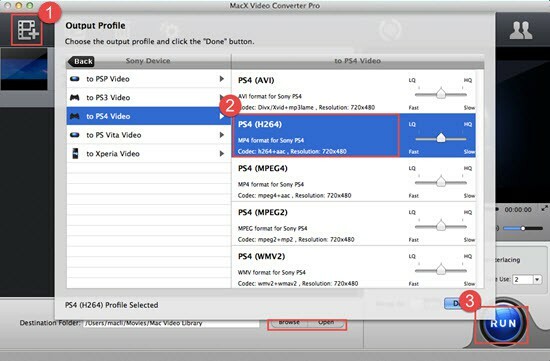 Check whether your video file type and codec are supported by PS4. For instance, if MP4 video is in H.264/AVC HD and audio in MP3, you cannot play MP4 on PS4. 3. The PS4 media player only accepts FAT and exFAT formatted USB drives. 4. Difference data types or file sizes might as well cause playback issues. Any you have to convert it to the video/audio format PS4 supports or tweak the parameters before playing it. Despite Sony PlayStation4 supports many video formats like MP4, MKV, AVI, MTS, etc, there are still increasing demands over PS4 video converter to turn PS4-incompataible video formats into the one playable on the game console. MacX Video Converter Pro can be a solid assistance. Built-in 320 video codecs and 50+ audio codecs, it converts virtually any video file (H.265, MKV, MP4) to/from PS4 supported video formats without needing to know any codec, resolution, bit rate, etc in advance. 1. Convert all videos (MKV, H.265, VOB, AVI, MP4, WMV, FLV, etc) to PS4 video formats like MP4. 2. Download online videos from YouTube, Facebook, Vimeo, etc for playing on PS4/PS3 offline. 3. Transfer PS4 video files to Mac, PC, iPhone, iPad, Android, thanks to the 350+ readymade profiles. 4. World's no.1 fast video converter for PS4, surpassing rivals by as many as 5 times. 5. Maintain perfect balance between the output quality and file size for PS4 playback. 6. Trim, cut, merge and even add subtitles or watermark to PS4 game videos for sharing on YouTube. Step 1: Launch the PS4 video format converter after free downloading and installing it. Tap "Add File" button to load the video you want to convert to PS4. Step 2: Once there pops up a drop-down window, choose the PS4 as the output format. Just go Sony Device > to PS4. You don't need to tweak any parameter settings as the program automatically sets the best result for you. Step 3: Hit "Browse" button to save the output file and tap "RUN" to start converting to PS4 video formats. After the conversion, you can directly copy the video to USB drive that is inserted into the USB port > select "Video" from the main menu of the PS4 > hit "Display All" to see the video file appearing on PS4 once finding the USB Drive -> press the triangle button > choose "Copy" to start transferring to PS4 hard drive, after that you can play video on PS4 from the USB Drive. Note: the PS4 produces jaggies when playing PAL DVD as a result of the lack of file mode detection for PAL content. So if you've got any DVD playback issue on PS4, you can rely on a DVD ripper to rip DVD to PS4 supported video formats beforehand. PS, both the classic and the new encrypted DVDs can be copied and ripping to the video format readable on Sony PS4/PS3.